Spiro T. Agnew. 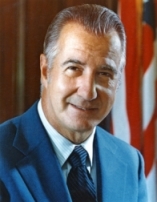 [Source: University of Maryland]Vice President Spiro T. Agnew resigns. 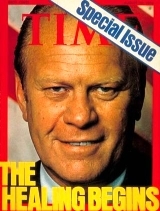 He will be replaced by an appointee, House Republican Gerald Ford (see October 12, 1973). Agnew, a conservative Maryland Republican with a long history of racial repression, ethnic jokes, and racial slurs in his record, appealed to conservative Southern voters as Richard Nixon’s vice presidential candidate in 1968 and 1972 (see 1969-1971). Agnew was the first vice president to be given his own office in the West Wing. [Time, 9/30/1996; US Senate, 2007] But by mid- and late 1971, Agnew is battling attempts from within the White House to force him to resign (see Mid-1971 and Beyond). Entity Tags: Robert Hartmann, Nixon administration, Henry A. Kissinger, Gerald Rudolph Ford, Jr, Donald Rumsfeld, Alexander M. Haig, Jr.
Watergate Allegations against Rockefeller - Rockefeller’s naming as vice president, strongly supported by President Ford, is briefly held up by unfounded allegations that Rockefeller hired thugs to disrupt the 1972 Democratic National Convention, and that the papers to prove the allegations were stolen from the offices of convicted Watergate burglar E. Howard Hunt. The charges are leveled by an elderly anti-Communist activist named Hamilton Long. 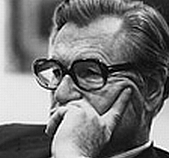 The story leaks to the press, and Ford, taking no chances, orders the FBI to investigate Rockefeller, Bush, and senior staff aide Donald Rumsfeld for possible selection as the vice president. Long’s allegations prove baseless when Watergate investigators locate the safety deposit boxes in which Long says the documents are stored, and find the boxes empty. President Ford discusses media reports of a feared coup attempt or unauthorized nuclear strike in the final days of the Nixon presidency (see August 22, 1974) with his ad hoc chief of staff, Alexander Haig, and Defense Secretary James Schlesinger (see August 25, 1974). Ford believes the leak that formed the basis of the story came from the “highest level of the Pentagon,” but he is unaware that Schlesinger is most likely the leaker. He is also unaware of the hornet’s nest of bureaucratic rivalries involved in the situation. 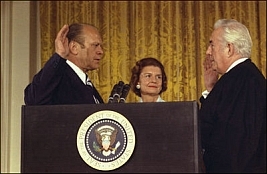 Ford knows nothing of the strained relations between the White House and the Joint Chiefs of Staff going back to the Moorer-Radford spy affair (see December 1971), nor of Haig’s blurred loyalties and his network of connections between the Pentagon, the National Security Council, and the White House. Ford is distressed by the stories, and furious when Haig assures him that the story is false—no such measures had been taken. Implications of a Secret Deal - Ford worries most that the story will escalate into a whirlwind of media speculation about the nation being “at the brink” during Nixon’s final days, and more to the point, the media and the citizenry may begin speculating about the possibility that he took over the White House as part of some sort of secret deal. Ford also knows that such an extraordinary leak three weeks into his presidency is a direct insult to his own position. Ford orders Schlesinger to straighten out the entire mess right away. Haig Also Involved? - Although Schlesinger denies his involvement in the stories, his credibility in this matter is wanting. And, if the stories are indeed true, then Haig must have been involved as well. Indeed, former Nixon aide Charles Colson will later write that Haig himself initiated the reported military watch, asking the Pentagon to disregard any order from Nixon. 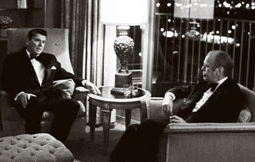 Like Schlesinger, Haig denies any part in the Pentagon watch, and calls the idea of a military coup of any stripe “an insult to the armed forces.” Haig will later accuse the so-called “countergovernment”—Congress, the courts, and the press—of successfully engaging in their own coup of sorts, in combining to drive both Nixon and former Vice President Spiro Agnew (see October 10, 1973) from office. But Haig has also dropped dark hints of his own to reporters about “dangers to the country deeper than Watergate,” and has spoken about the threat of “extra-constitutional” steps during Nixon’s last days. Entity Tags: US Department of Defense, Spiro T. Agnew, Jerald terHorst, Gerald Rudolph Ford, Jr, Charles Colson, National Security Council, James R. Schlesinger, Alexander M. Haig, Jr.